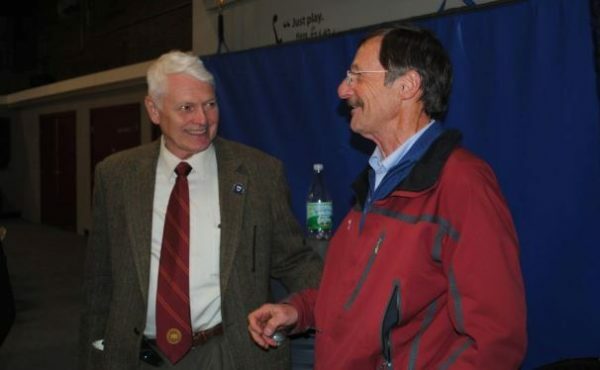 Incoming Saco Mayor Marston Lovell talks to outgoing Mayor Ron Michaud at the Saco Community Center on Tuesday night. Marston Lovell has been elected Saco’s new mayor. Lovell beat Don Pilon 2,874-2,021 and will replace current Mayor Ron Michaud, who is vacating the position. Lovell is currently a county commissioner, a position he will vacate before being inaugurated as mayor in December. Lovell, 71, is the owner and operator of Manufacturers Analytics. He also served nearly 18 years as an officer with the Army Reserves. Pilon, 66, is a real estate broker with The Maine Real Estate Network. He served eight years as a state representative and two years as mayor of Saco. Lovell has served as a county commissioner for three years, and previously served six years on the city council. Lovell shook hands with and thanked supporters at the Saco Community Center on Tuesday night after the votes were tallied. He said he was feeling a mix of enthusiasm and nervous. “I’m feeling ebulliently cautious. I’m very happy but I’m also looking at a very interesting two-year period,” he said. Lovell said he spoke with many constituents, handing out his card with his phone number. He said he will continue to maintain good communication with his constituents and is looking forward to serving his community. “My goal is to do an objectively good job,” he said.